My first show in Shreveport in 10 years was somewhat eventful. 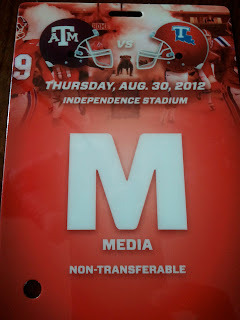 It was possibly the biggest game in Louisiana Tech history, and delayed 6 weeks by the threat of Hurricane Isaac that forced the postponement of the originally scheduled August 30 meeting. But to illustrate the difference between the type of resources that divide Texas A&M and Louisiana Tech, I cite my credential from the actual October 13 game. Notice they didn't bother to reprint from Week 1. Texas A&M raced to a 27-0 lead and we were headed for your garden variety big school-small school, rich school-poor school blowout. 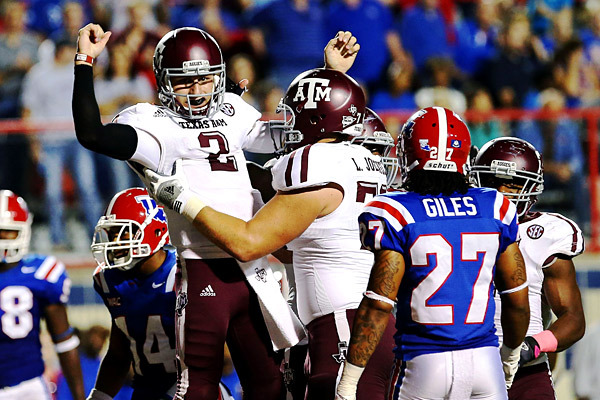 Aggie freshman Johnny Manziel (aka "Johnny Football") was flinging the ball all over the place, running for touchdowns, and The Kerrville, Texas product was inspiring visions of Friday Night Lights and Varsity Blues. But the second half broke out, and as Johnny (Johnny Carson) once asked, "Was that a football game or a track meet?" The La Tech Bulldogs never quit. They put 41 points on the board after halftime and came within a 2-point conversion of forcing overtime before ultimately submitting 59-57. The game featured 1,293 combined total yards, and we may have seen the eventual Biletnikoff Award winner, Quinton Patton. The La Tech PR department is obviously all over it, but Patton walked the walk with 21 catches for 233 yards and 4 TD against the Aggies' beleaguered defense. But the story was Johnny Football. The freshman tallied 576 yards of total offense (395 pass, 181 rush) and 6 total TD (3 of each), breaking the SEC total offense record that he set just 2 weeks ago against Arkansas. A&M's most important drive started at their own 1 with about 3 minutes to go, leading 53-44. Manziel dropped straight back and fired a 34-yard strike over the defense. Then two plays later, Johnny Football took off on a 72 yard gold rush on a 3rd & 23. Manziel is listed at 6'1" but I don't believe it. But just because he's a shorter, scrappier, unconventional QB type, and a freshman - doesn't mean he can't win the Heisman Trophy. Danger Starts With A Big "D"